Dr Georgi Stamenov, MD, PhD, is a leading Bulgarian expert in assisted reproduction and minimally invasive gynecological surgery. He is the founder and director of Nadezhda Women’s Health Hospital, a modern clinic developing as a regional centre of excellence in IVF, reproductive surgery and maternal-fetal medicine. Dr. Stamenov and his team strive to be at the forefront of fertility science and are active in medical research. Dr. Stamenov has been serving as invited speaker and surgeon for numerous medical education events on modern approaches in IVF and applications of mini-invasive reproductive surgery, including laser surgery. 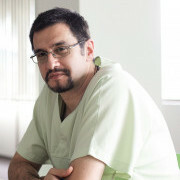 Dr. Stamenov and Nadezhda Hospital are well-known for high success rates in poor prognosis patients, including cases of advanced maternal age, premature ovarian failure, endometriosis, recurrent implantation failure, severe male factor, immunological factor, as well as unexplained infertility. Key expertise of the clinic comprises full scope of IVF programs (including natural cycle), laser hysteroscopic and laparoscopic surgery incl. office surgery, ICSI/IMSI, EmbryoScope, genetics and immunology, PDG/PGS, advanced sperm analysis and preparation (SDI/DFI, MACS), sperm and egg donation programs, fertility preservation, management of early pregnancy loss, intrauterine fetal surgery. Multidisciplinary team, modern medical technology, and personalised approach make up the unique blend that has turned Dr. Stamenov’s clinic into the happy place where dreams come true for thousands of couples each year.